The main garden is put to bed. Tomato, melon and leek patch all cleaned up. Hoop House in the morning. Still chugging along. It is a whole new world around here. 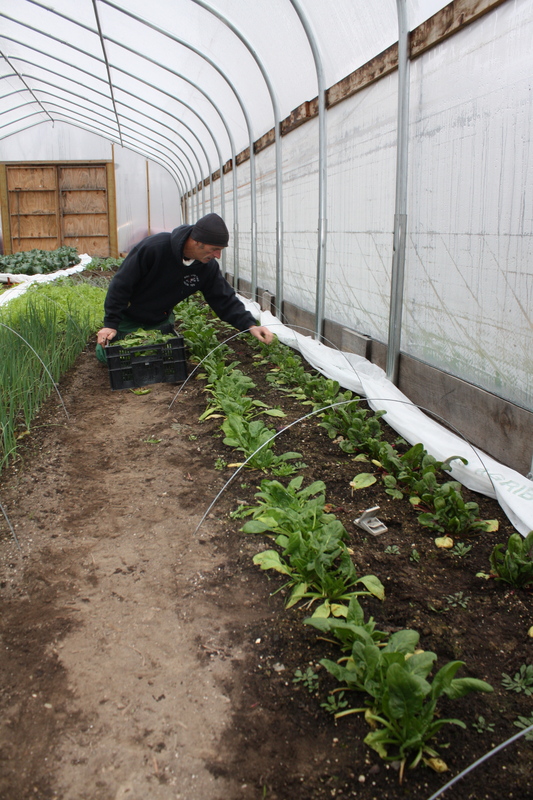 The final crops are being pulled from the garden and hoop house and we LOVE! 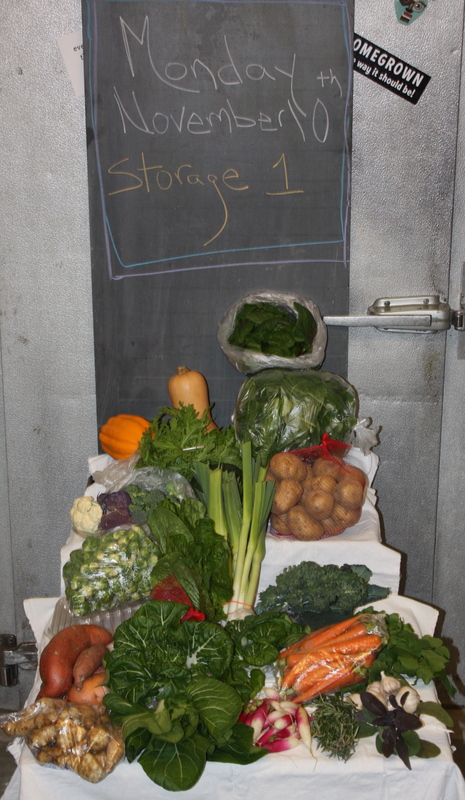 the fact that we are eating wonderful greens harvested in November! Delicious. 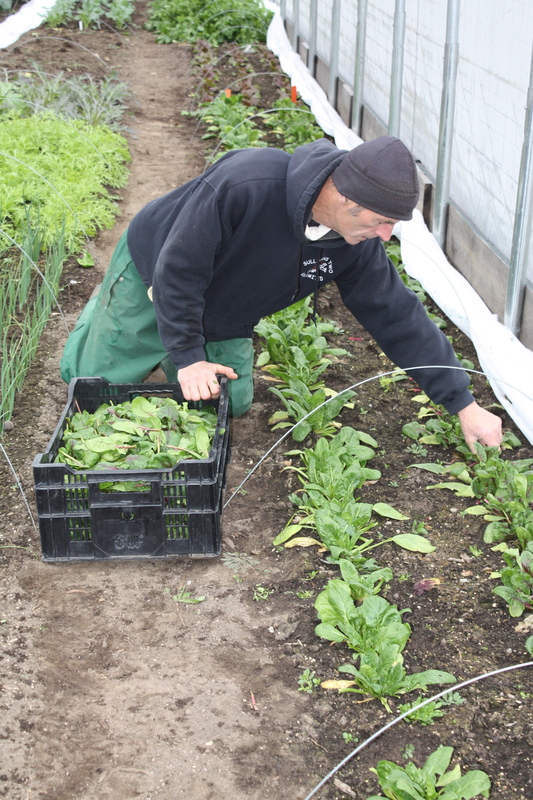 We have been very busy with autumn clean up and getting the last of the crops out and final winter over crops in. 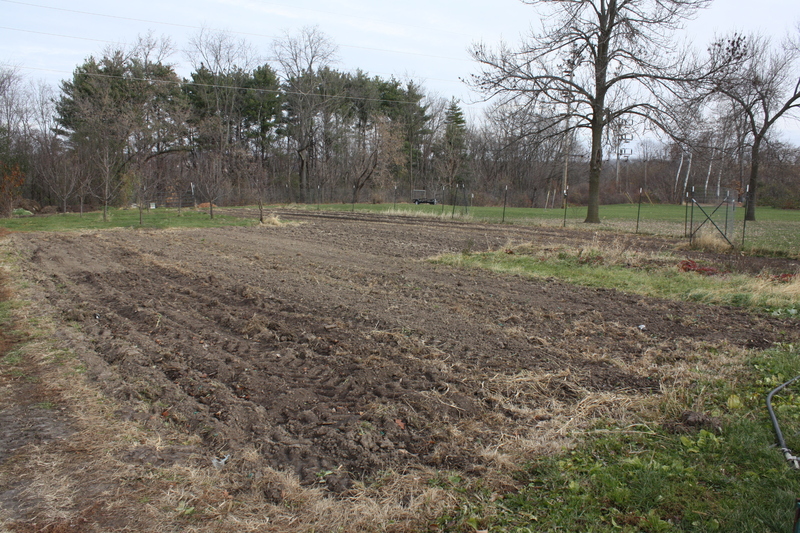 It is a lot of work and time to pull down all the tomato vines and clean up the space. 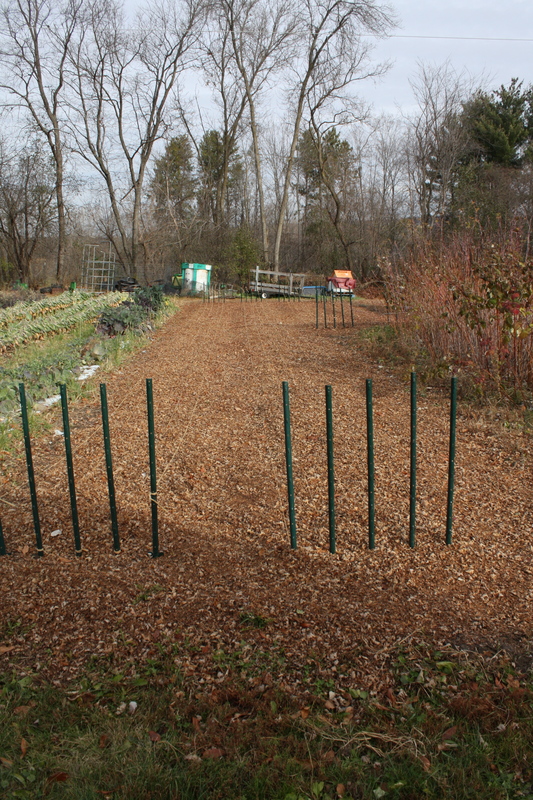 The trellis all need to be removed and stored, plastic mulch removed and irrigation pulled before the soil is tilled and prepped for Spring. And then we repeat the process with the cucumber area and then focus on other areas of the garden with tidy, tidy, tidy. Having things all set before the snow flies and ground turns solid makes life so much easier in the Spring. We are in great shape with a few tiny “want to” duties to tackle but the BIG “have to” duties have been checked off the list. We are grateful the weather has been comfortable and mild for finishing up the season. 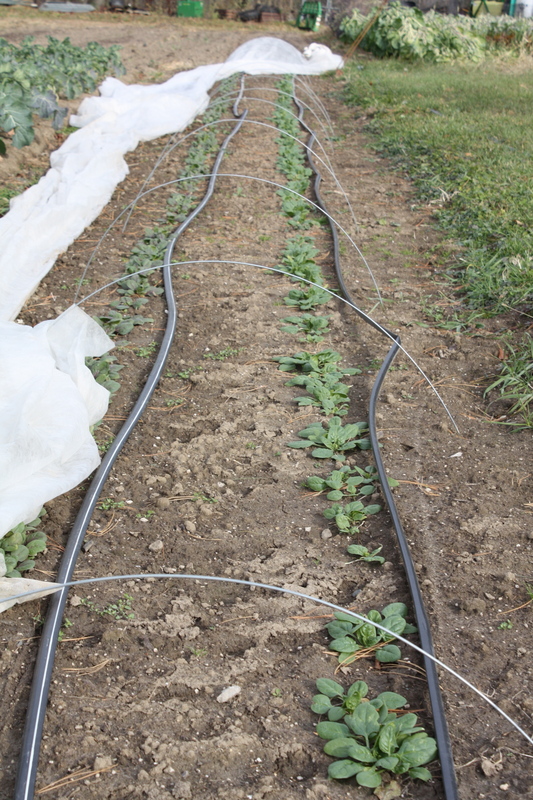 Winter over spinach well established out in the garden all set for Spring. 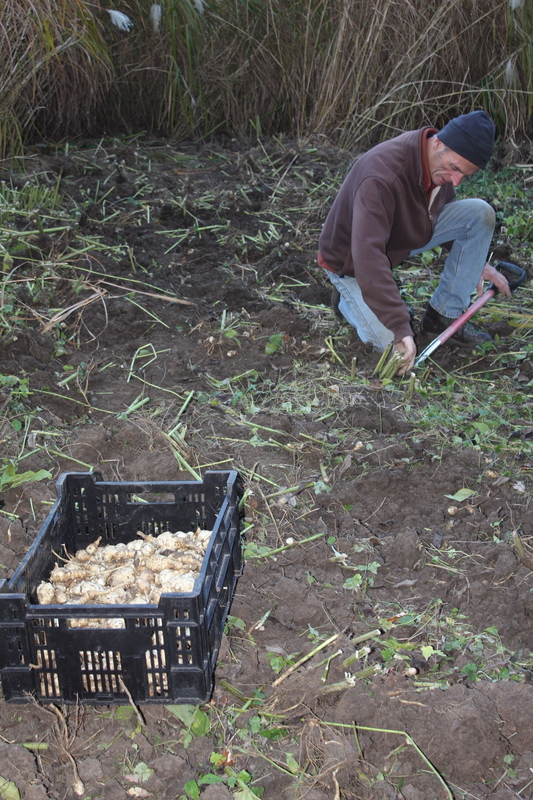 We spent a long day planting 2400+ cloves of garlic by hand! Scott had the leaf mulch on by dark and we were happy the job was complete in one day. Our favorites-Music and German Red were planted. 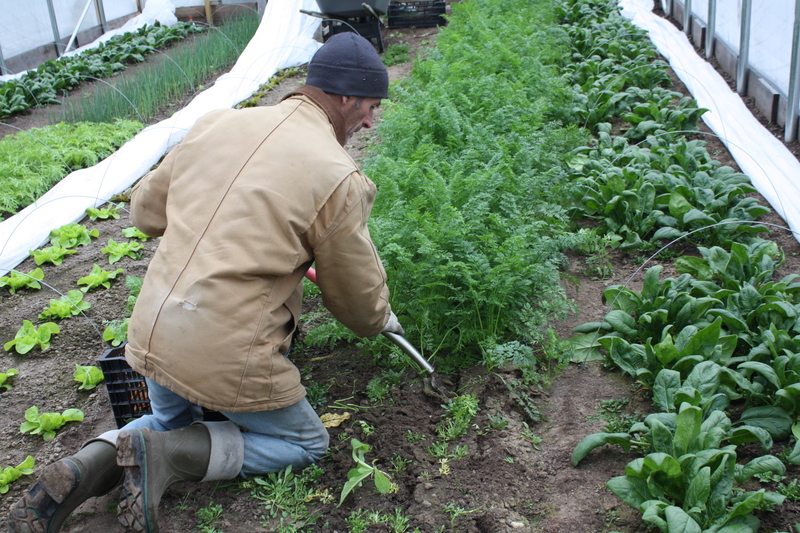 The garlic harvest this year was abundant and strong and we were able to save and replant our own supply. A first for us not having to buy in organic seed garlic. We are already catching ourselves planning out next year. 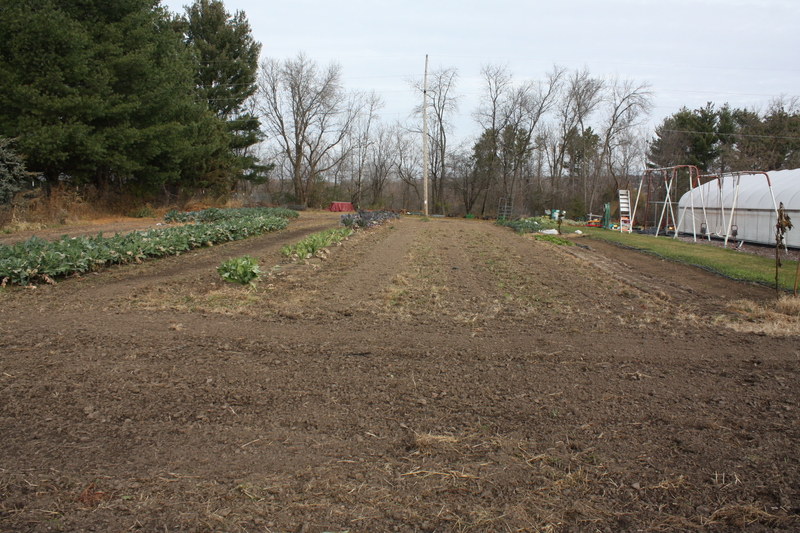 Fun to do and dream about next year’s garden…..Seed catalogs will arrive and our potato order will go in soon. We are already excited about 2015 season. With the garden clean up well under control, tools properly stored away, and the greenhouse and hoop house ready for winter we felt there was time to work on another favorite job again. We are even taking orders this year for Thanksgiving Bouquets. 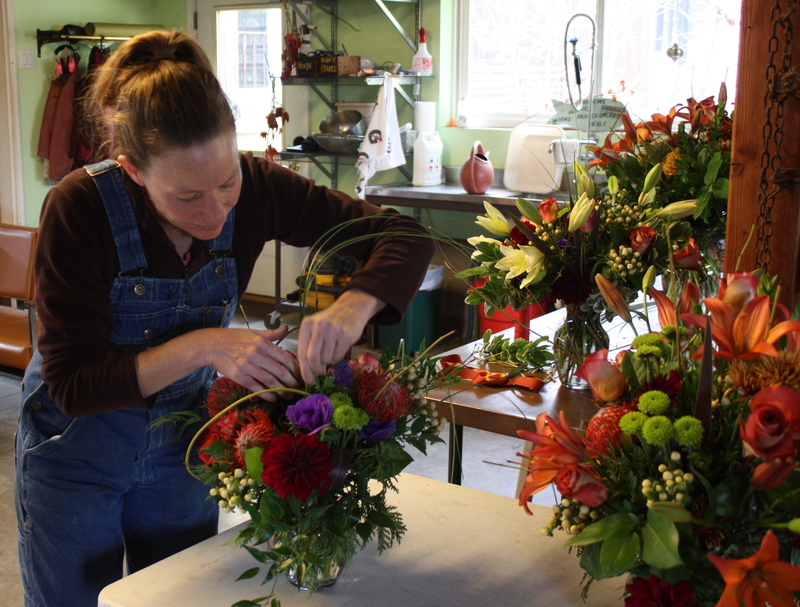 Jennifer working on floral pieces for a special event. 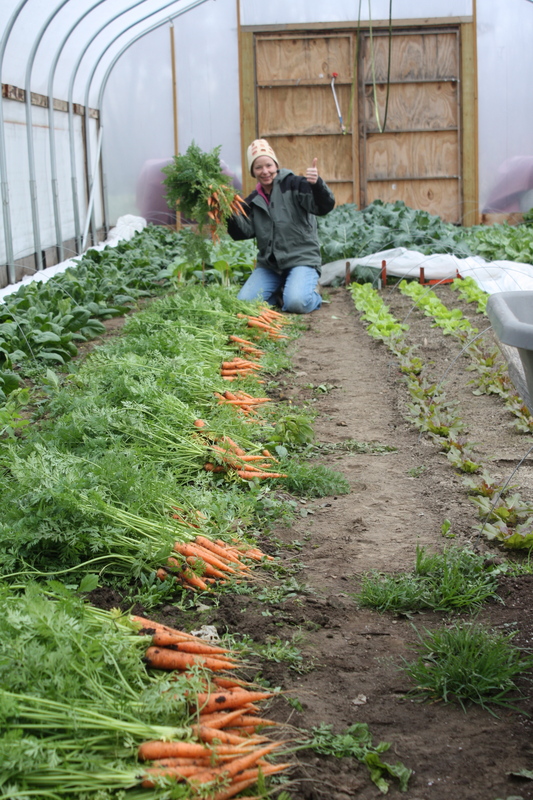 We have had a fantastic finish to the season and thrilled to share the bounty with all of you. An amazing pick up this week with lots of wonderful surprises. A BIG! box and a Foxline tote of goodies for everyone to take home for Thanksgiving cooking. 33 pounds!!! WOW! Enjoy. Arugula-A snappy bunch for fresh eating or braising. Mazuna Mix-Lime green and purple-A mild mustard flavored green. Delicious fresh or braised. Lettuce!-REALLY Lettuce….Juicy heads of romaine. Spinach-A huge HUGE! bag of delicious green leaves and another bag of the beautiful Red Kitten. 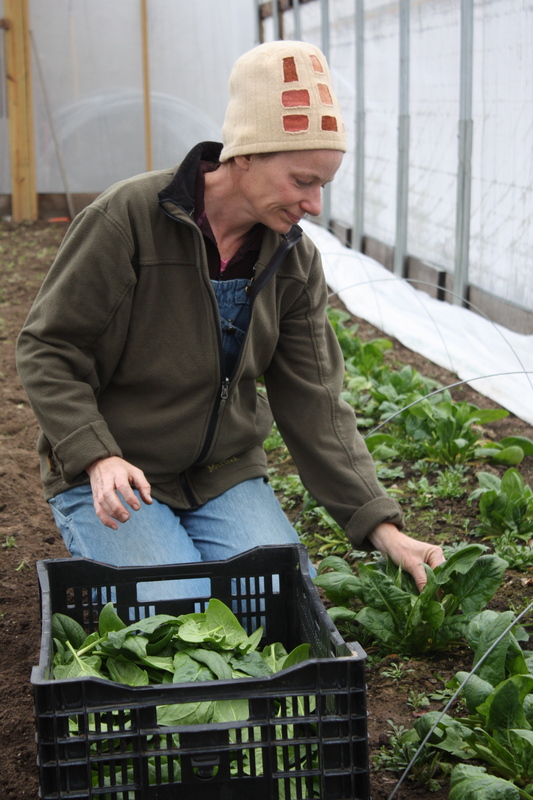 Scott harvesting Red Kitten Spinach. 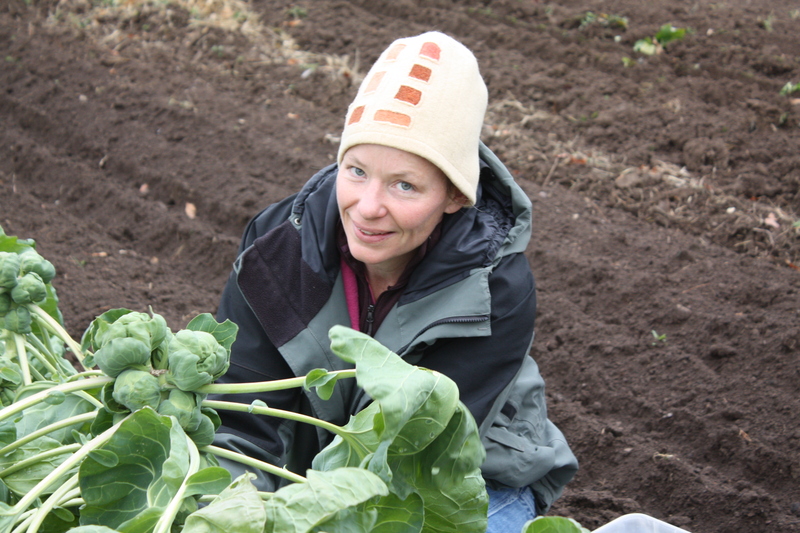 Jennifer harvesting the big juicy Space Spinach. 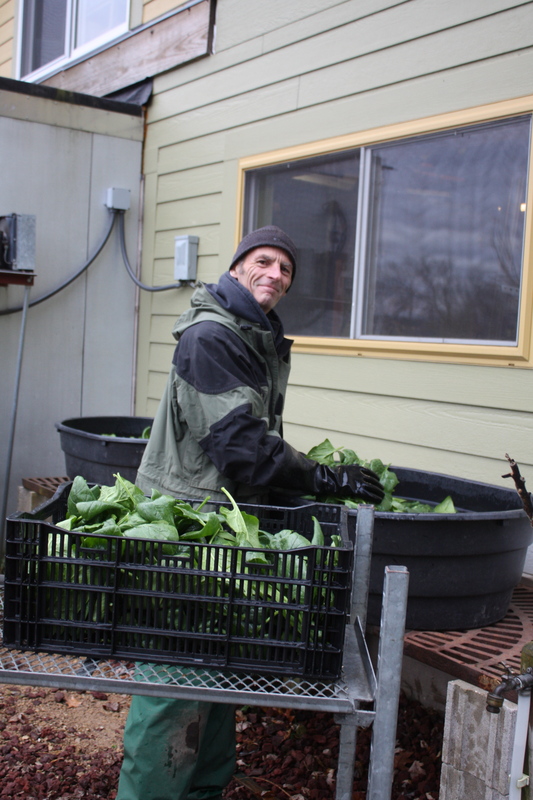 Scott double rinsing the spinach. Pac Choi-A mix of 2 varieties. Win Win and White Flash. Mini Pac Choi- A bag of tiny pac choi. 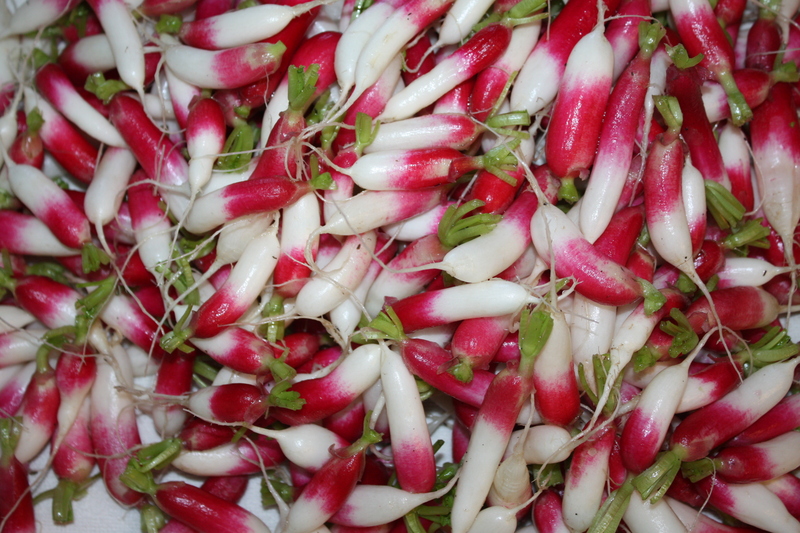 Radish- Nice big bag of the mild French Breakfast. Maeve said they look like peppermints or candy canes. Kale-A mixed bunch of young kale leaves. 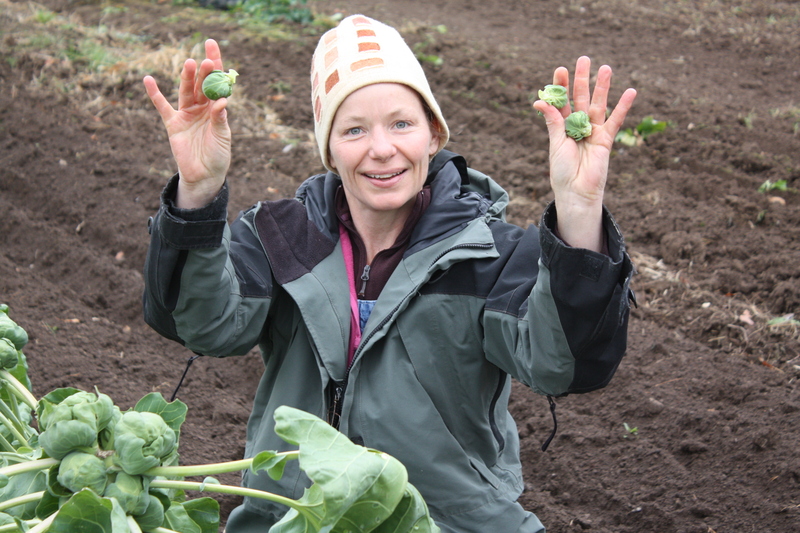 Brussels Sprouts-FINALLY! They are smaller this year but they are here. We were worried there for awhile that there was going to be nothing. Enjoy the bounty! 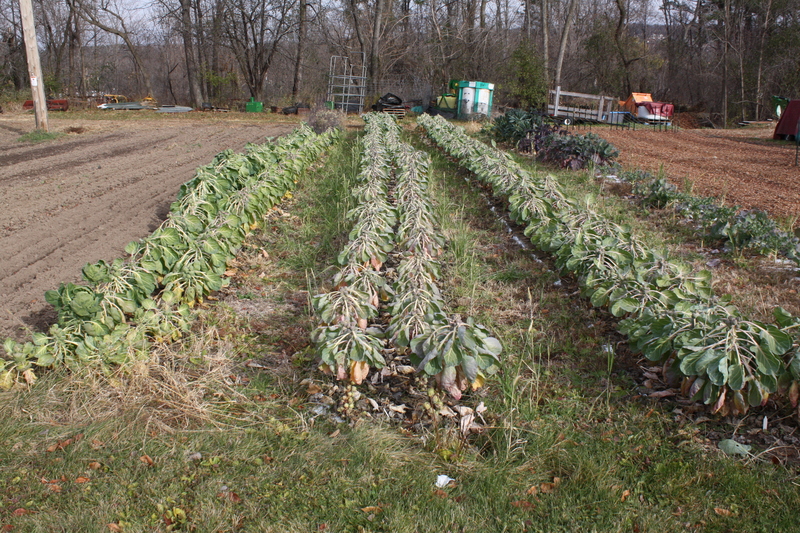 The Brussels Sprout Patch. We will see if we can get 1 more harvest out of it this year. Broccoli/Cauliflower Mix-A big bag of those delicious broccoli side shoots and small cauliflower heads. Sweet Potatoes-Our best year ever with this crop. 3 Pounds each. Potatoes-A variety called Molly. 6 pounds each. Garlic-A combination of Music and German Red. Onion-2 pound bag of storage onions. Squash-A butternut and 2 acorns. Carrots-Sweet storage carrots. 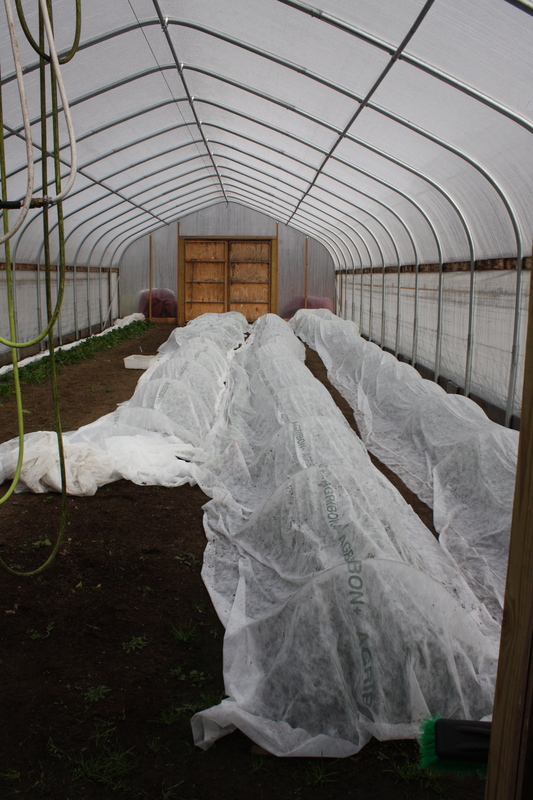 Hoop House grown. 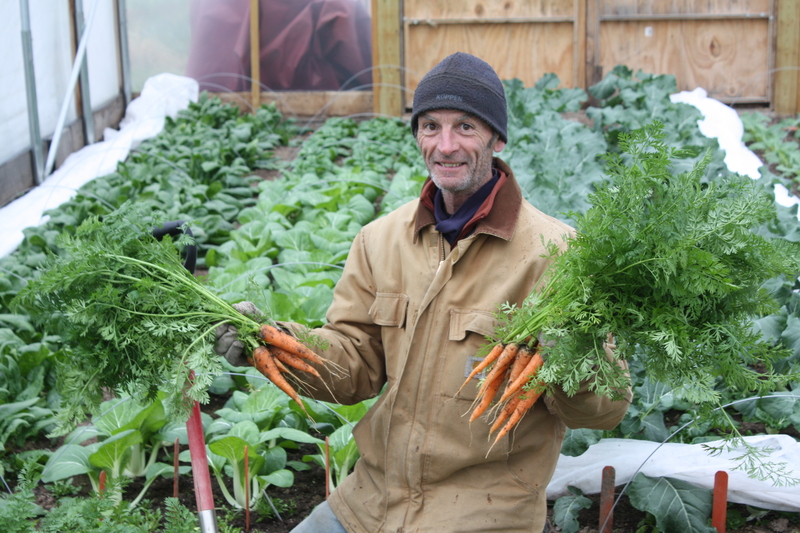 Scott hand digging the carrots. 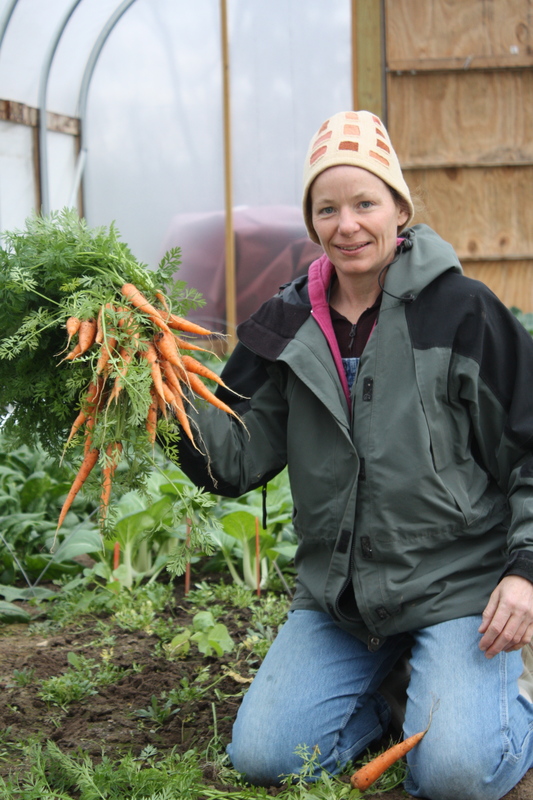 A great final carrot harvest. Leeks-Scotts goal this year…Grow big thick leeks. Here they are. Enjoy. Sunchokes-A nice big bag of these nutty treats. Will store ALL winter in the fridge in a plastic bag. Scott digging the sunchokes earlier in the Fall. Holy cats! What a huge haul! Will be excited to pick it all up later. Exceptional as usual!